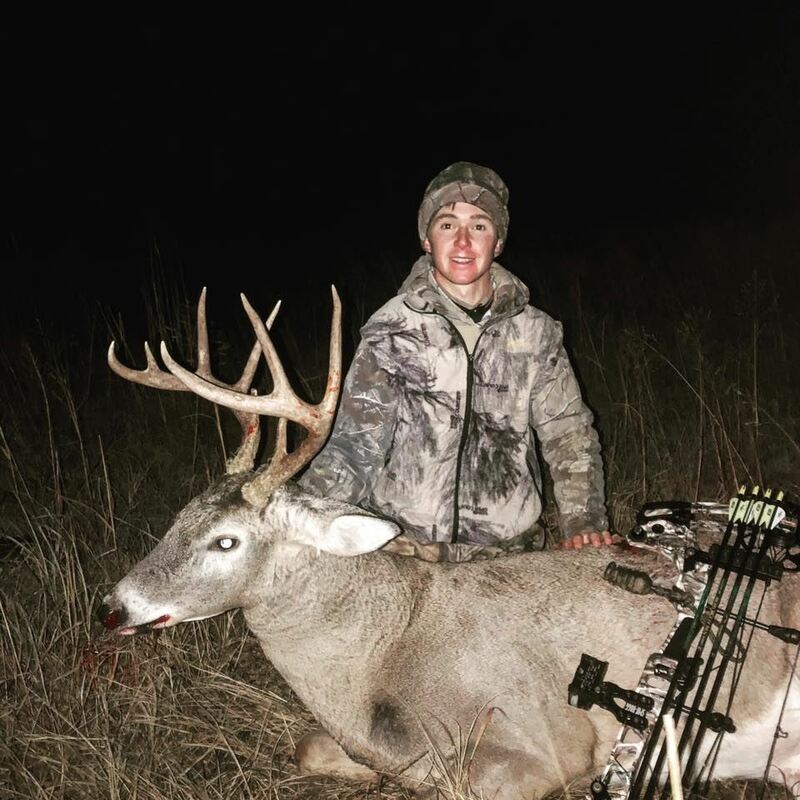 The first week of November is a time that bowhunters mark on their calendar every year as a period that is magical in the woods, and offers hope of getting a crack at filling a tag. This proved to be true as I found myself kneeling over a mature 4x5 on the dreary evening of November 3rd. I had just taken my 2nd buck of the 2018 season but it was a bitter sweet feeling of being done. At the time, I thought I was tagged out with 2 turkeys to go to fill the remainder of the Super Tag, but I couldn’t have been more wrong. 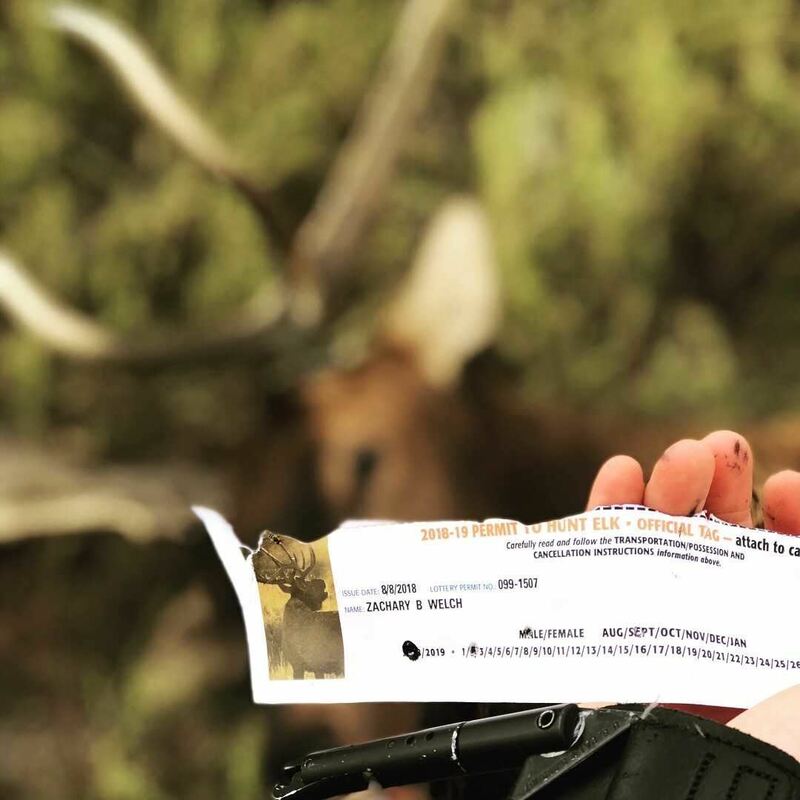 Three weeks later, I found out that I had been given the opportunity to purchase a 3rd buck tag since the Super Tag did not count towards my regular archery tags for the year. With a mature 7x5 point on camera and Thanksgiving break just around the corner, I jumped at the opportunity to buy a 3rd buck tag in hopes of having a chance at him. The bittersweet feeling was gone and now had turned into anticipation and excitement. 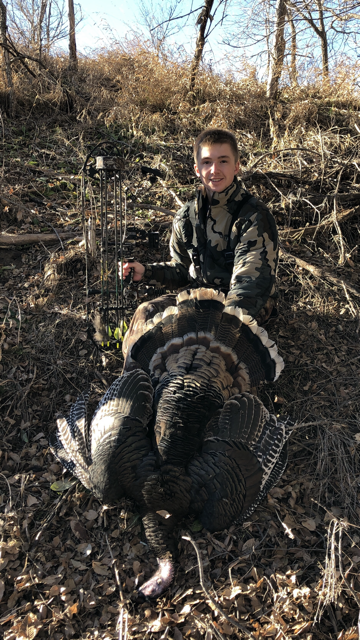 After hunting a few days over Thanksgiving break with no sign of the mature 12, I returned to school for the remainder of the semester with the thought in mind that my Christmas beak would be focused mainly on filling the two turkey tags remaining on my Super Tag, as well as filling the freezer with some does. Little did I know what the next two weeks would have in store. The Friday before finals I was walking back to my apartment with the thought in mind that I would spend the entire weekend preparing for finals. A quick phone call to my dad would change these plans within a matter of minutes. After talking to my dad, I made a spur of the moment decision to return home. I used the excuse that being at home would help me focus on studying more, but with a perfect wind, and 3 beautiful days in the forecast following the blizzard, I knew there was more reason to make the 2 and a half hour drive home for other than just studying. Within a matter of 15 minutes, I had packed my bags packed, grabbed my bow, and of course my books, and was on the road. The next morning we checked trail cameras and one revealed to us a massive, mature 4x5 that had wandered through multiple times the last few days in daylight, as well as heavy deer activity the past week. Needless to say, my attention turned from schoolwork to the buck that had been making several appearances in the last few days with the recent snowstorm. The wind had changed for the worse so I wasn’t able to hunt the stand I wanted and it looked like it wasn’t going to happen. After studying, I decided that I would take my gear with me and make a quick hunt on my way back to school that Sunday since the wind had changed for the better. It was a bitterly cold evening and I climbed into my tree and practiced drawing my bow with all of my layers on as I typically do. After not being able to draw my bow comfortably, I shed a few layers, re-knocked an arrow, practiced drawing again, and turned around to sit down for the next several hours. My heart jumped in my throat as I caught a glimpse of white tines raking a cedar tree just 50 yards away. I couldn’t believe it. It was the same mature 9 point that we had on camera the past week. With the cover of the wind, the buck was completely unaware I was there. After watching the buck for more than 10 minutes, I watched as he walked behind a brush pile and stood for a few minutes. Moments later the tops of his tines dropped down and disappeared behind the brush pile just 70 yards from the base of my tree. Time seemed to creep by as I kept my eyes focused on the brush pile where the buck had disappeared. 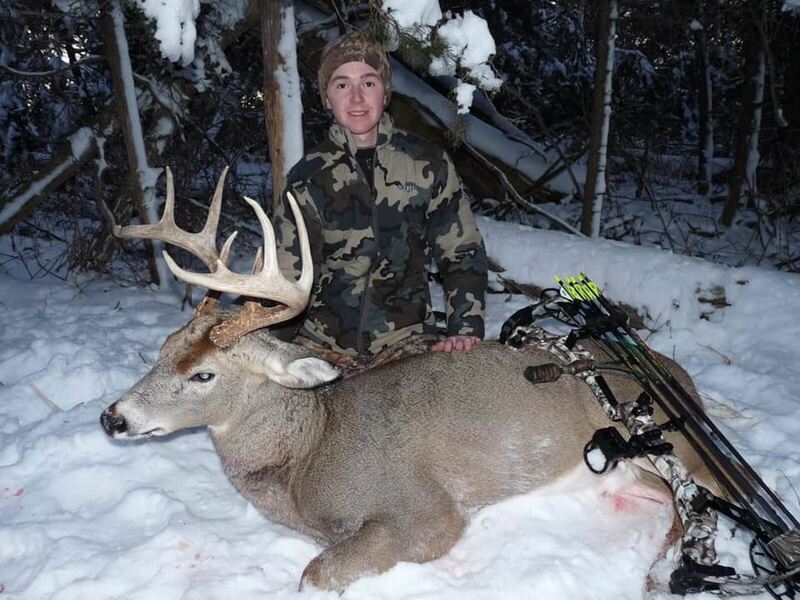 A long, nerve racking hour later, the buck revealed himself once again and made his way over to the same cedar he had been shredding earlier. This time as he paused at the tree, he turned straight towards me, and stared at the trail straight ahead of him. With a flick of his tail, he was now on a mission down the trail that passed right under my stand. The buck took his time as he made his way toward me. 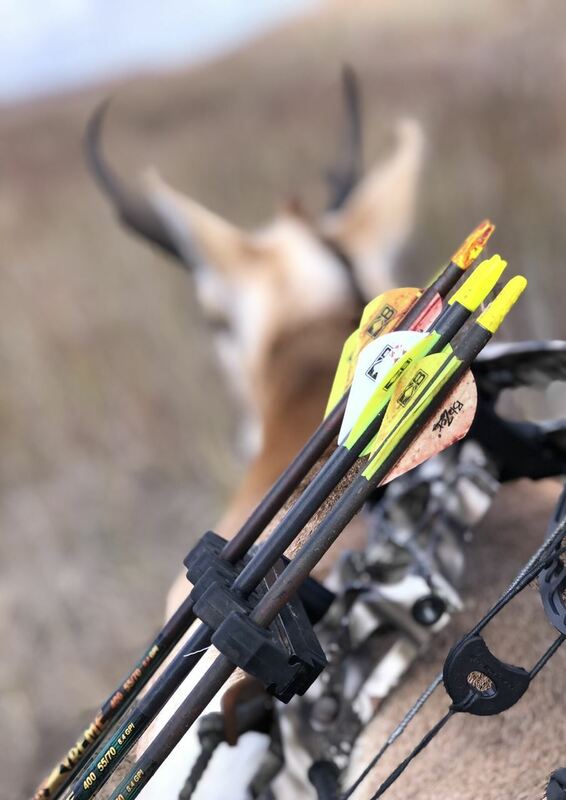 As the buck veered right 5 yards from me and stepped into an opening 15 yards away, I drew my bow and settled my pin on his last rib as he quartered away. I touched off the shot and the buck leaped forward with my arrow sticking from his side. He jumped over a log and ran back towards the direction that he was bedded in, leaving a crimson trail in the fresh snow behind him. Moments later, through a small opening, I saw the buck tip over backwards and the woods fell silent. “That never gets old,” I whispered to myself with a smile on my face. I sat in the stand for a few moments taking it all in. After a few minutes, I reached into my pocket for my phone and called my dad telling him the news. A little while later we took pictures, loaded the buck, and I was on my way back to school for the finals week on an emotional high! This is not where the story ends however. Finals week flew by and before I knew it I was on my way home for a three and a half week break with plans to spend the first few days at the cabin in hopes of punching the remainder of the super tag with a couple of turkeys. The first night, I sat in a tree stand in hopes of filling a doe tag, or have a chance at one of turkeys that had been hanging around the area. As I was leaning back in the tree, soaking in the warmth of the sun, the purr of a flock of turkeys broke the silence. I looked up to see a flock of 20-30 birds coming through some cedars. I made a few yelps and slowly hooked my release on my loop and picked out one of the biggest jakes as they neared the trees I was in. My arrow hit on a dime and the Jake made it another 10 yards before collapsing. “Perfect, one down, one to go”, I thought. The next day I would awake to a crisp, frosty morning and return to the same stand. An hour later, a group of does came by at 17 yards and I picked one out. I shot and watched as the doe trotted off, only making it 30 yards before going down within sight behind my stand. Christmas break was off to a hot start! After celebrating family Christmas, I returned for a doe hunt a few evenings later. Low and behold, the same flock of turkeys was once again making their way along the sidehill about 40 yards from my position. Two of the Jakes held up behind the rest of the flock as they headed over the ridge. I picked out the lead bird and settled my pin. I watched as my arrow hit exactly where I was aiming. The bird flopped and within seconds, he was finished. I walked over and grabbed my prize. To many, it may have seemed like any other fall turkey, but to me, it was the end of a 3 and a half month long journey that had been full of the craziest experiences I had ever been through in my life. My Super Tag was now complete. All with my bow in one season! Days later, after celebrating family Christmas at my grandparents’, I made the 2 mile drive to our cabin in hopes of punching my last doe tag and finishing out the season. An hour into the hunt, I found myself drawing back on a mature doe as she fed in the rye just 21 yards from my stand. I released the final arrow of the season and watched as it found its mark in the center of the heart. A short tracking job later, and I was standing over my season finale just as the first flakes began to fall of the incoming 2-day storm, a perfect ending to say the least. I took time to take a few self-timed photos, grabbed my gear, and began the hike back to my cabin. This season will be hard to top; I have been blessed with opportunities I could have never dreamed of. As I hiked out of the bottom, I began to reflect on the entire season. From drawing the Super Tag in July, to bugling bulls in early September, to the snow filled days of the late season and everything in between, the experiences that I had, the people I shared them with, and the animals I have harvested will all stick with me for the rest of my life. 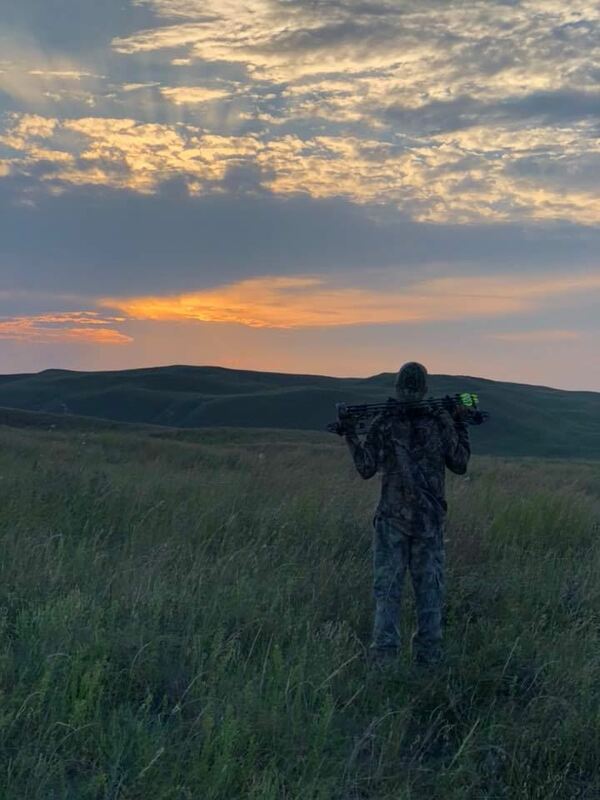 I try to take time to thank God every day that he made me a bow hunter, and as I found myself reflecting on a dream season as I walked out of the bottom in the fading light with the snow falling down, I had all the reason to thank Him even more. Everything up to this point in the season seemed like it had been all sunshine and rainbows. 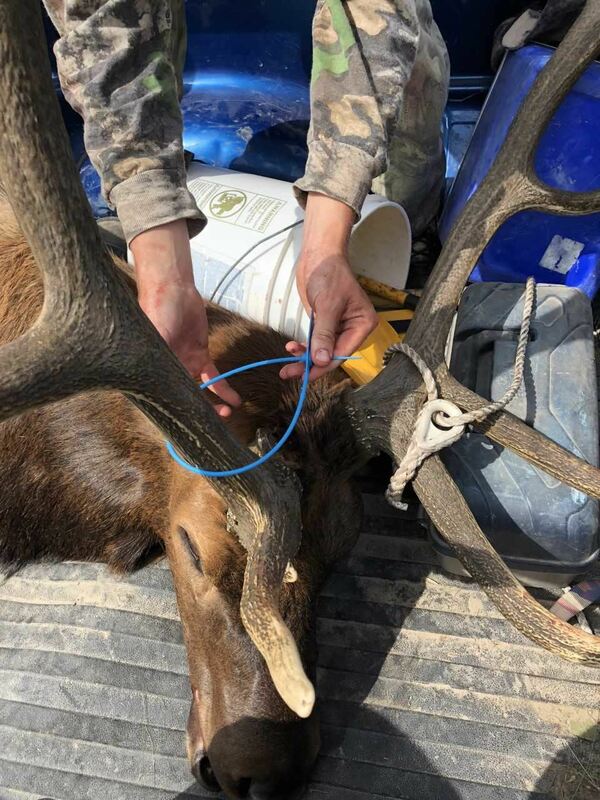 I had experienced the highest of highs in bow hunting over the last month with the elk hunt and the harvest of the whitetail just 2 weeks earlier. Little did I know how much that was about to change over a series of events that would unfold over the next 48 hours. I was once again on my way home to hunt for the weekend after taking a week off from the woods. While the plan was to get back into the tree stand that evening with an extra deer tag in my pocket that was not part of the super tag, I was looking forward to the next day already when we would be walking the hills in hopes of finding a muley or even better an antelope to fill the third leg of my super tag that was still un-punched. Although I did see a shooter buck that didn’t come within shooting range that evening out of the tree, as soon as I climbed out of the stand, my mind was already on the next morning. The next morning, we walked into the first set of hills and made our way to the top of a hill not long after the sun broke the horizon. We glassed for a bit and after a bit, we spotted the unmistakable bright white of a hind end of a muley buck over a half mile away. With the sun shining down on him, he stuck out like a sore thumb against the brown of the dying grass. With an extra deer tag in my pocket, we decided that we would go after him. He was a nice buck and would by far be my best muley yet. After seeing another nice buck on the way in, and spotting this one, the hunt was off to a hot start. It was one of those mornings that everything seemed to be out and moving. The wind began to pick up just a little bit, making it perfect stalking weather. This was going to be good. We got up, and began walking in the direction of where we last saw the buck disappear over the hill. When we reached the top of the hill, we made it just in time to watch the buck work towards a small side hill about 600 yards away, and eventually bed down. With the buck bedded, and just the right amount of wind, it was time to make a move, everything was right where we needed it to be. We made our way across the pasture and got to within a couple hundred yards of where we saw the buck bed. We moved quietly and angled off towards a small hill that was between the buck and us, and crawled to where we could see him bedded. We didn’t have much of an option from here, it was too open and we would be busted if we tried moving. We decided that we would circle around and make our way through a blowout that was about 30 yards behind the buck’s bedded position, we should have a shot if all went according to plan. So we backed away and circled around, moving quietly in the direction of the deep blowout directly downwind of the buck. The wind was perfectly in our face and we peeked up over the edge. The sharp tines poking up out of the grass gave away the buck’s position. He was 25 yards from us and bedded, but all that was visible was the top of his rack. We knelt down and knew we had to wait for him to stand. Whether it would be 2 hours or 2 minutes, the buck had to stand at some point, and I was willing to wait however long it took in order to get a shot at this brute. A few moments later, the buck began to fidget and my dad whispered to draw my bow. I drew and my heart began to pound as the big buck stood up and stared at us just 25 yards away. I reached full draw just as the buck turned his head towards us. I put my pin on him and touched off the shot. My heart sank as I watched the arrow fly harmlessly over his back. In a flash, he was gone. I could not believe what had just happened. 25 yards is a shot that most bowhunters would consider a chip shot, and I just whiffed it. I stood there in disbelief, not knowing what to say. We talked about the shot for a bit, and I said that I completely lost it. It seemed like when the buck stood, I had forgotten everything I had ever learned in that moment. It hurt, it sucked, and it wasn’t fun missing the shot, but that’s part of bowhunting, and that’s why we do it. I kept telling myself that and promised that I would learn from it, but man did it hurt. After missing the muley, my dad spotted a big antelope buck with a handfull does working down a hill fairly close to us. We switched modes, we made our way back to the pickup and got the antelope decoy. I was pretty excited, after not seeing much for antelope this year, and an opportunity to fill the third leg of my super tag, the herd was a welcoming sight to say the least. After one failed stalk attempt, the antelope didn’t go far. We were able to locate them again and watched them through the binoculars as they fed about 200 yards from us. 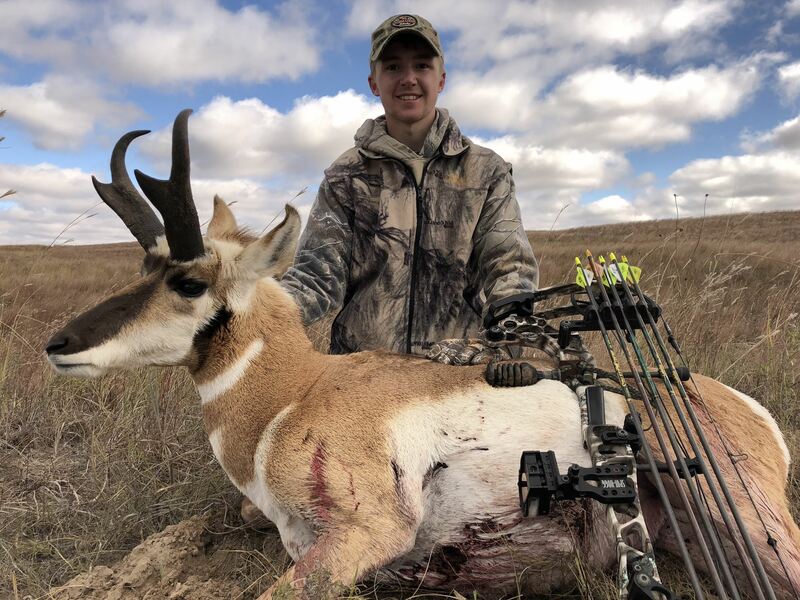 If any of you have ever hunted antelope spot and stalk, you know just how tough it can be trying to make a move on a buck that has multiple does with him. This particular buck had 9, making it very difficult to make any move without being busted. Eventually the herd fed through a valley and got into some small, rolling hills. When they went out of sight, we made our way across the same valley. We were just a minute too late getting to where we wanted to be, the antelope had fed through a small cut below our current position just minutes before we got there. It would have been a perfect opportunity, but we were just moments too late. We watched as they fed from the small cut into open terrain, where we now had no opportunity to make a move. The herd soon bedded in the open and we layed flat on top of a hill a couple hundred yards from where they were bedded. They layed there for what seemed like hours, and showed no intention of going anywhere soon. Finally, the buck got all of the does up one by one and started walking toward a windmill just over the hill behind them. I nudged my dad and as soon as we saw the last goat go over the hill, we went after them. We ran down the hill and up the next, and knew that the antelope were just below the next hill. We snuck near the top of the hill and belly crawled the rest of the way. I knew that when we saw them next, they were going to be close to shooting range. When we finally were able to see the herd feeding just below the hill, they were just barely out of shooting range. We decided to be patient and let them get over the next hill, the last cover that was available before they would be in the wide open area that surrounded the windmill. Once again, as soon as the last antelope walked over the hill, we moved quickly to get in position before we ran out of cover to work with. This time when we got to the top of the hill, the herd was feeding on a downward slope well within shooting range. The buck was to the left of the does, about 30 yards from them and didn’t have the slightest idea that we were there. My dad gave me a range. “59” he said. The moment he said that, out of the corner of my eye I noticed a doe had us pinned, but the buck was still unaware of our presence. The buck picked up his head and looked at the doe as I drew, I settled my pin and squeezed off the shot. The shot felt perfect, and I watched as my yellow and white fletching was on a B-line for the buck’s chest. With the buck now alert, he dropped and whirled and my broad head gave him a fresh haircut down his back. The whole herd ran behind us and high tailed it for the next set of hills. Antelope are notorious for jumping the string, but I didn’t have the slightest idea of how this one managed to get out of there without catching my arrow. The buck was slightly quartering to us, and by the time my arrow got there, he was facing almost straight away and had ducked more than 10 inches. I couldn’t help but to shake my head, had it not been for the doe, we would be celebrating right now. It was a perfect opportunity, and the shot hit exactly where I was wanting, there wasn’t much more that I could do in that situation. I was grateful for the opportunity nonetheless, antelope are one of the toughest animals to hunt spot and stalk with a bow, and its situations like this that are the reason why I respect them so much. We covered some miles that day in the hills, and the hike back to the truck was pretty quiet. I was reflecting on what had happened that morning and thinking of all of the ways it could have ended differently. In the end, had it not been for that day, I dare to say that the rest of my season would not have unfolded the way that it did. This was the biggest learning experience I had in a long time. Needless to say, it also fueled my fire and made me want to succeed even worse. Experiences like this are why we bowhunt, and is what makes a bow hunter so much more grateful when it all comes together. It would be a long week and a long drive back to school, but I knew exactly what I would be doing the next weekend when fall break rolled around. My eyes were on the clock and 12:05 could not come fast enough. One class to go and I would be free for the weekend. Plans of getting in the deer stand that evening with a cold front approaching made the time go by even slower as class began to drag on. Finally, 12:05 hit and I hustled back to my apartment and took off for home. It had now been 3 weeks since the elk hunt and I was chomping at the bit to start chasing deer. With an uncommon early season northeast wind, my plans had changed the day before and I would be sitting in a stand that I had never hunted. I always like hunting new spots, and I was excited to see what this spot had in store. I sat for a while and didn’t see or hear anything. It was a beautiful evening and I knew it was a matter of time before something would start moving. After a while I turned around to check my surroundings and noticed the top of a deer’s back sticking up over a patch of tall grass behind me about 100 yards away. It looked like a big body, but I could not tell for sure what exactly it was. The deer kept its head down and fed for a little longer before eventually picking up its head and revealing its white, massive 10-point rack a few moments later. Immediately my heart began to pound and I knew it was a deer that I wanted to release an arrow at if I was given the chance. I watched the lone buck feed for a few more minutes in the tall grass as he made his way towards the strip of trees that I was in. The buck had two choices once he got to the trees. He could walk east, the opposite direction of me, or he could take the trail west that came out into a clearing less than 20 yards from me. My hopes soon began to sink when I saw the buck angle east out of the grass away from my direction. Needless to say I was still very excited, I had already seen a shooter buck and there was still plenty of time left in the hunt. I turned back around and sat facing forward with my bow resting on my lap. It was a perfect evening, the crisp air with the slightest breeze present really made it feel like fall was finally here. I sat for a few moments after the buck went out of sight and it wasn’t long before I heard a small twig snap in front of me. I could not see what made the noise since the view to the trail in front of me was blocked by a cluster of trees. I stood up slowly to see if I could get a better view of the trail, and if not see what made the noise, at least be ready if it was a shooter buck. When I stood up I saw one single tine through a small opening between the branches. I could not tell if it was a shooter, but knew it was definitely a buck. The deer took a few more steps and revealed more of its rack through a small opening. I knew exactly then that it was the same deer I had just seen walking away from me just a few minutes before. My heart began to pound and I knew he was going to give me an opportunity as he started to step into the clearing. I drew my bow as he stepped out from behind the tree and held my pin on him at full draw as he walked towards me. I kept my pin on him as he continued into the clearing. At 19 yards, the buck turned and stopped broadside and my pin was already on him. I took a couple of seconds to settle my pin and squeezed the shot off and watched my arrow disappear exactly where I was aiming. The buck jumped and took a few strides, immediately I knew that he was not going far. The hole that was visible right behind his shoulder assured me that the shot had hit true. The buck ran for a few strides before stopping behind a cedar tree with only part of his hind-quarter visible to me. I noticed that he was starting to sway back and forth. “Go down right there” I whispered to myself. The buck took a few more steps and I saw one last flash of white just behind the tree and heard a loud crash. The buck was down not more than 40 yards from the tree. I couldn’t believe it! It all happened so fast, and everything came together perfectly. I sat my bow down on the seat and let it all soak in. It was a beautiful evening and what had already been an unforgettable season had just got even better. I thanked the good Lord for a quick clean kill and held tight for a few minutes. I climbed down from the tree and I was ready to go get my hands on this buck, I was beyond excited! As I walked up to him, there was no ground shrinkage at all. He was a beautiful big-bodied, mature 10-point and no doubt one of my better bucks. I called my dad and told him the news and he was on his way to come get pictures and help me get him loaded. While I waited, I sat down by the fence and took it all in. It was a beautiful evening and I couldn’t have asked for more. My dad arrived a little while later and we took some pictures before loading up the buck to take him into town to hang. I told the story when we got back to town as we enjoyed elk burgers to cap off the day. The next morning we butchered before celebrating the wedding of two good family friends and neighbors. Everything worked out perfectly and just like that the second leg of the super tag was complete! I drove back to school reflecting on the hunt, still in disbelief that the season had started off this way. Now the focus turned to the third leg, which I knew would without a doubt would be the toughest challenge of this tag, but that story is later to come! 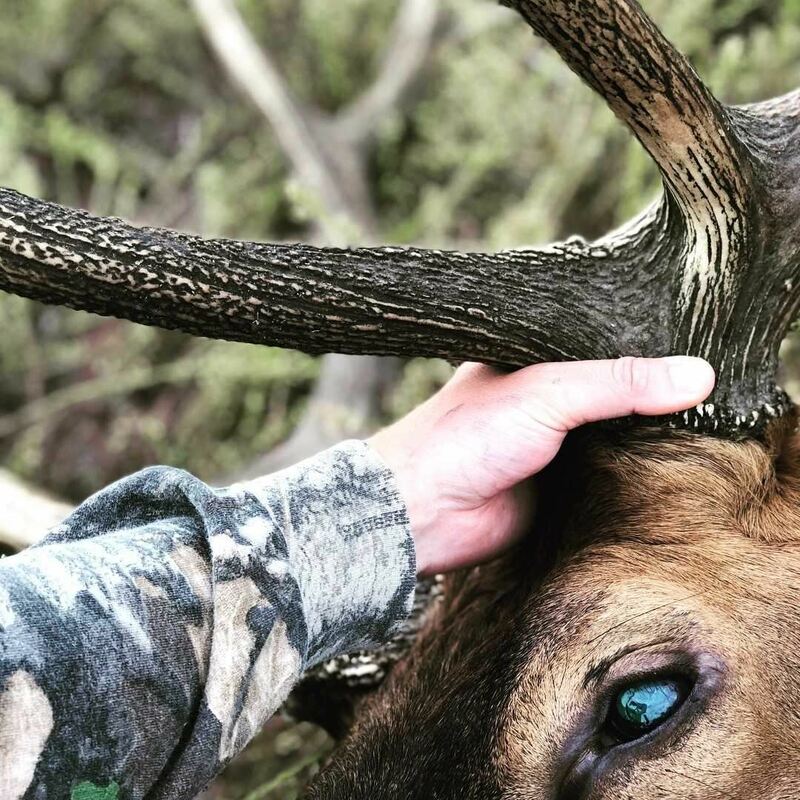 I wrote this story about my Super Tag elk hunt just a few weeks ago. I hope you enjoy reading it as much as I enjoyed writing it! Here it goes, enjoy! I will never forget hearing my first bugle; the big bull crested the hill and let out a bugle that broke the silence of opening morning. 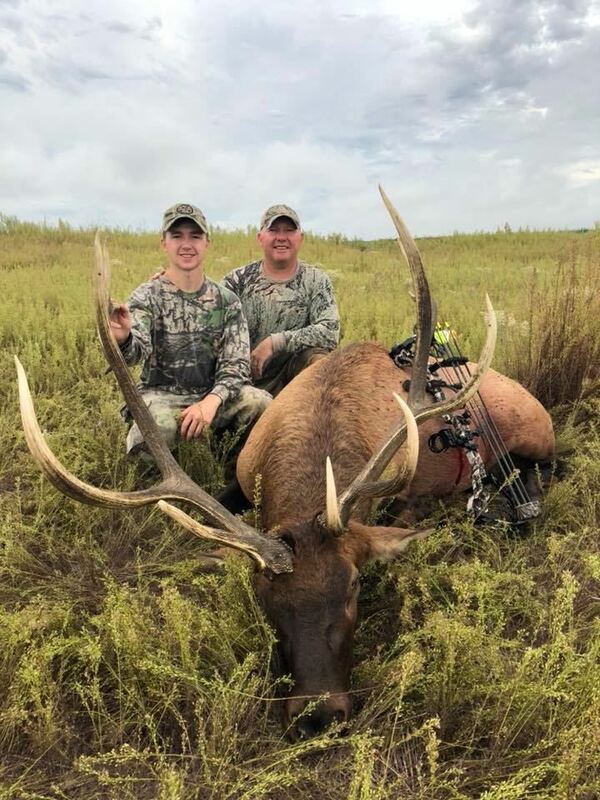 It was enough to give even the most experienced and seasoned hunter chills, let alone a 21-year-old college student on his first elk hunt. Our first hunt of the season was off to a hot start, but it paled in comparison of what was soon to come. At the time, I didn’t really know much about the super tag, but knew in the back of my mind that it was the only chance left for a Nebraska elk tag. I remember looking at the odds from the year before of drawing it, and saw that they were nearly 1 in 1600. I thought for a long time about whether to apply or not, and finally I decided that at the end of the day $26 was not that much money, and if anything at least I could donate to Game and Parks. One of the last things I remember seeing on the Super Tag information page was that the winner would be notified by phone call, little did I know how much this would come into play later in this story. The next day I was in the exact same position, I was in the gym when my phone rang. It was my dad; I looked at it for a minute and thought about calling him back later. Something inside of me told me to answer this phone call, I had a weird feeling that it might be important. The conversation started just like any other, but took a turn when he said, “guess who drew that super tag?” After already having had a tease the day before, I said “who?...” thinking he was either about to play a joke on me, or someone we knew drew the tag. “You did!” he exclaimed. For the next few minutes I did not believe him and paced back and forth trying to decide whether I was about to be let down once again even worse, or I actually had actually drawn the tag. My dad explained to me that Nebraska Game and Parks had contacted my mom and notified her that I had drawn the tag. It all hit me then that this had actually happened and I couldn’t believe it. It all felt like a dream. I actually had drawn the Super Tag; needless to say, I was flying pretty high for the next few days. That night I set a goal to shoot my bow every single day until season, and little did I know just how much it would pay off in the end. The days following the news that I had drawn the tag were spent mostly contacting landowners. We had decided that we were going to focus on the North Platte area in the Box Elder unit. We had some connections there thanks to some friends and I was off to a good start getting permission. Out of all the calls that I made, I never got a solid “no” from any of the landowners. 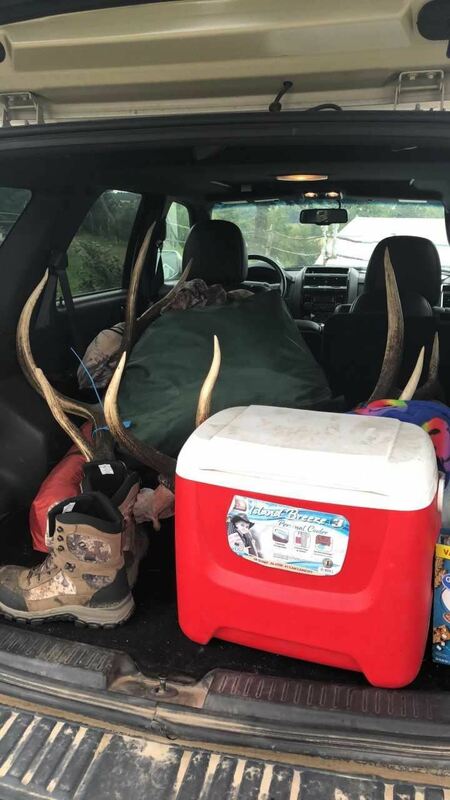 Some of them had family members or hired hands that were hunting and said that they had first priority, however, I had a number of places that told me they would be more than happy to have me hunt elk on their place. Along with the landowners in the North Platte area, I also made contact with some good family friends close to the Ainsworth area since my elk tag was a statewide tag and I was not limited to one unit. Needless to say, we had plenty of ground to hunt. It was now a matter of finding elk and getting ready to hunt when September 1st rolled around. Days turned into weeks and before I knew it, summer was drawing to an end and school was starting again. I still had not missed a day of shooting my bow and I refused to let that slip now that my schedule was getting even busier with classes starting. The week of September 1st finally arrived, and I began to get things ready for the weekend. As the weekend drew nearer, the time seemed to move slower and anticipation was at an all time high. Friday could not come soon enough. I made sure to take care of everything in school, so that when the weekend rolled around I would be able to focus on the hunt. Finally Friday arrived, and as soon as class was over, I packed my car and headed west for North Platte, but first I had to make a stop. I stopped at the archery range on the way out of town and took one last shot. I had to keep my promise. I did not know what to expect the first weekend, I really thought about how we had not had a lot of time to scout, so I figured this trip would be more of a scouting trip and getting the elk figured out. Regardless, I was happy to be going elk hunting as it was something I had always dreamed of, and knew we had plenty of time to hunt. I met my dad and Matt Gideon that evening south of North Platte near Wellfleet, we would be staying with our good friend Chad Stengel and his family for the weekend. This was very convenient as it was just a short drive away from where we would be hunting for the next three days. I can’t thank him and his family enough for putting up with us for the weekend! That night we went and met with a couple of the landowners. One of them insisted that I ride with him so he could show me where exactly the property lines were, as sometimes on maps they can look deceiving from what they actually are. My dad and Matt followed in the pickup behind us. After showing me around, I shook the landowners hand and thanked him again for the opportunity to hunt elk, I can’t say enough about how nice all of these landowners were that I was dealing with! When I got in the pickup, my dad and Matt informed me how they had seen a big bull crossing the pasture as we drove by, needless to say, this had all of us fired up and we had our spot picked out for the morning hunt. That morning was unforgettable. It was without a doubt, one of my favorite mornings of hunting in my life. We had been sitting in our spot for about 40 minutes when my dad nudged me and said “elk!” Sure enough, on the horizon, a cow came over the hill, and then another, then another. The elk just kept coming and coming, and even a few of them being little bulls. Finally, a moment I will never forget for as long as I live, a big herd bull crested the hill and let out a bugle that echoed through the early morning air. “That was awesome!” I whispered to my dad, as we looked at each other with both of our eyes just as big as the other’s. I had just watched my first elk bugle, and it was a moment I will never forget. We watched the elk for about 45 minutes while they chased each other around, fed, and bugled on a little patch of green grass on the far side of the pasture. Eventually they went into the cornfield for the day. The hunt ended with a small rag horn that came into about 120 yards with a cow and a calf. It was an action packed hour that had us fired up and ready to hunt again that evening! On our way back from the morning hunt, we found a spot in a small shelter belt of cedars where elk had been crossing to get into a pivot that I had permission to hunt on. This was not far from the pasture that we were set up on and was certainly sign from the same elk that we had seen that morning. The herd bull had a tree completely shredded from rubbing on it were they were crossing. We had brought a tree stand with us and we knew exactly what to do for the evening. I had never imagined that I would be hunting these elk from a tree stand, but I was now glad that we brought one, as I knew that the chances of having an elk come by were fairly high by the looks of the trail. That evening I climbed into the tree stand and had a perfect view. I could see the pivot in front of me with the trail through the trees, and the green patch the elk had been on that morning to my far North. I could see a long ways and knew that I would be seeing elk that night; it was just a matter of time. Not long after being in the tree, I saw a few cows pop over the hill and start making their way across a patch of wheat stubble towards the trail below me. Not long after spotting them, a big, ivory tipped bull crested the hill right behind them. I put my binoculars on him and decided immediately that he was a shooter. The cows started angling away from me, along with the bull. I decided to cow call softly, I had nothing to lose. I let out a soft mew and the big bull lifted his head and snapped his head in my direction. I cow called again, this time a little louder. The bull turned and was now on a b-line directly for the trail below me. My heart was pounding out of my chest. “This is really going to happen,” I said to myself. Just then, I felt the wind on my cheek. “Oh no…” the bull stopped dead in his tracks and turned the other way and went back to the cows. So close, yet so far, a matter of moments and I would have had my opportunity at this bull. As heart broke as I was that the big bull had caught my wind, it was such a cool experience to see him come in like that after calling at him, and to top it, it was still early. As it got later and the sun was setting, I spotted more elk, this time they were not coming my direction, they were making their way in the distance to the same green patch of grass that they had been on that morning. Cows and calves made their way to the green patch and following them was the big herd bull we had seen bugle that morning. I watched them until dark through my binoculars. At dark I texted my dad to come pick me up, I told him I had watched the whole herd go to the same place they had been that morning. With a southeast wind in the forecast, I knew exactly where we needed to set up in the morning. The cards were on the table and we knew right where we needed to be tomorrow. We all knew that we now had the best chance we’ve had yet the whole weekend at getting a chance at a bull. It would be another sleepless night. After telling the story of the close call with the big bull that evening, we watched football and discussed our plan for morning before heading to bed. My dad and I would be setting up in the morning in the pasture that we were in the previous morning, this time as close to the green patch as we could get since the wind was in our favor. The next morning came early; my alarm went off at 4:45 AM. I rolled over and sat on the edge of the bed for a minute after shutting off my alarm. I was tired, but the same time, I was excited. I knew that we now had a good idea of what these elk were doing and that today our odds of getting a chance at a bull were higher than we had at any other time during this trip. I set on the edge of the bed for a second before putting on my hunting clothes. “God, please give us a bull today.” With that being said, we all got dressed and were out the door within minutes. The drive there was fairly quiet, we were all tired from not sleeping much from excitement the last few days, however, you could feel the excitement in knowing that we knew we were setting up exactly where we needed to be. Matt dropped us off, and my dad and I walked into the pasture, we set up just on the outside of some tall weeds that separated us from the green patch by about 150 yards. We set up and waited in silence in the dark as we waited for the sun to come up. The sun began to rise and gave way to a cloudy morning with a steady breeze out of the southeast just as forecasted. Perfect, now we just needed the elk to do the same thing that they did the previous morning. Not long after the sun broke the horizon, two bulls and about 18 cows and calves started making their way from the south towards us right in a line with the green patch. The herd bull stopped and let out a bugle and continued walking. Moments later, all of the cows and calves were in the green patch with the two bulls hanging just outside of the herd. The herd bull chased the younger bull away from the rest of the herd and the younger bull moved quickly away from the herd to the north across the pasture. Now all that remained were the herd bull and all of his cows and calves on the green patch. They were right where we needed them. We went into the tall weeds, using them as cover, letting out cow calls as we went. The bull was ripping off bugles within 100 yards of us the whole time. We made our way to a small clearing in the weeds, the only opening we could really find. The bull was still bugling and had his cows herded up, we could only see the tips of his tines no more than 80 yards away from us. We knelt down in the weeds. My dad bugled at him and the bull snapped his head turned towards us. Once again he came bouncing towards us bugling. It was all happening so fast. 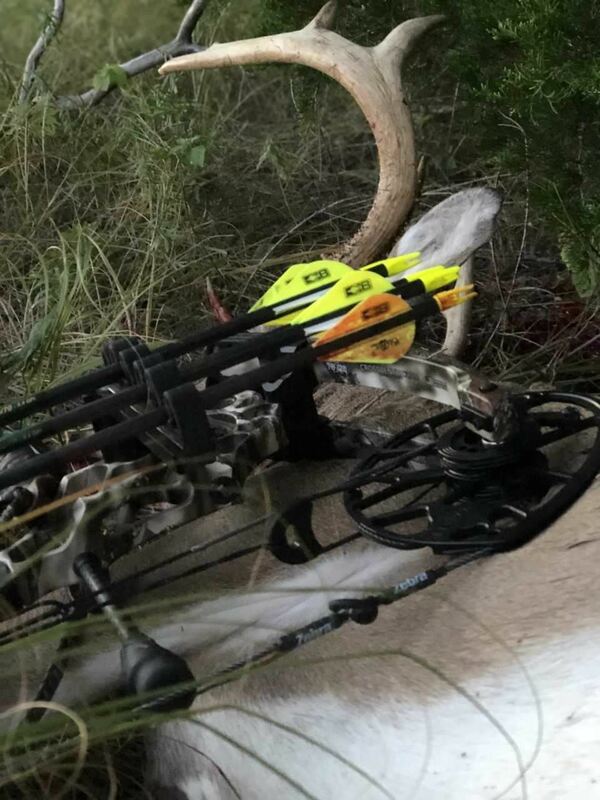 I drew my bow again and the bull stopped again at 10 yards, this time with a very small portion of his chest showing. “Shoot him” I heard my dad whisper as I was at full draw with my pin settled on the bull facing us. From my angle the spot that I needed open for the shot was covered by weeds, but from my dad’s view he had a perfect opening to the bull’s chest. Just as I thought I had a small opening to squeeze an arrow into, the bull once again whirled and began to herd up his cows again that were beginning to break up. This time the bull lead his cows out of the tall weeds into some shorter stubble. We once again got to our feet and made our way to the edge of the tall patch to where we were now out of good cover. The cows were beginning to walk away through the stubble and behind them the bull was walking at a steady clip. “Range him right there!” I whispered to my dad. “He’s 51!” my dad said as he clicked his range finder.” I drew back and gave him a couple mews trying to stop him, but no luck. Just then my dad cow called and the bull stopped in his tracks and looked in our direction. Time seemed to stand still as I settled my pin right behind the bulls shoulder. 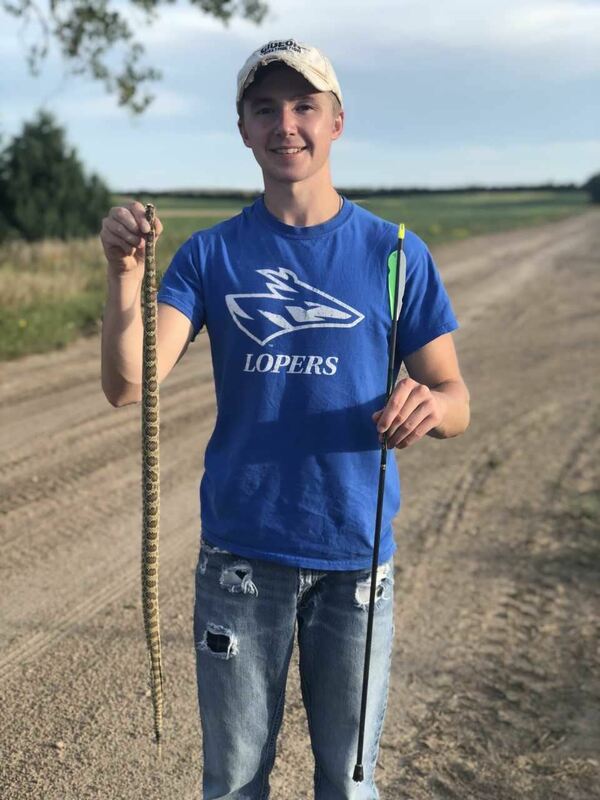 The countless hours of practice all through the summer, the thousands of arrows shot, and all of the dreaming about this moment all came down to this. I touched the shot off and it felt good. The next sound I heard was a hollow “thump!” that assured me that the arrow had found its mark. The bull ran for a few steps and I saw blood begin to run down his side. The cows took off in a blur and the bull stayed behind, looking very sick. “Liver,” I whispered to my dad as the bull walked to the edge of the green patch that he had been bugling and chasing on just an hour earlier. My dad and I watched the bull as he began to walk slowly across the green patch back towards a small group of trees in the middle of the pasture we had been hunting. In a split second, we decided that we should use the small strip of tall grass as cover that ran the length of the green patch to try to cut the bull off and get another arrow in him. I was confident that my arrow would do the job, but the sooner we could end it, the better for both the bull, and us. We snuck along the tall grass as the bull made his way across the grass patch. Finally, we got within range and my dad gave me a range, “71” said my dad. I took my time and the shot felt good, but it fell just short, just low under the bull. “Dang it!” I said as I looked at my dad. The shot felt good, but after being constantly on the move the last few minutes and having so much adrenaline running through my veins the shot was off. My dad assured me that it was fine, the bull did not even spook. The bull made it about 40 more yards before he bedded down. My dad and I layed down in the grass and watched him through the binoculars, he was hurting bad. Meanwhile, Matt had been watching the whole thing through the spotting scope from a ways away. We called him and he said the shot was a touch back, but not too bad. We agreed that we would wait for however long it would take for the bull to expire and watch him in the meantime as we knew he would most likely eventually try to make it to the trees just 100 yards from him. A few moments later the bull stood up. Just as soon as he stood, he fell back into his bed and we knew that he was really hurting. He began gasping and layed down on his side. My dad looked at me and we both knew that it was more than a liver hit. I had caught the back of the lungs and the bull was not too far from expiring, however, we knew if we could manage to get another arrow in him we could end it sooner. We made the quick decision to crawl up to the bull since we had plenty of tall grass and a small knob between us and the bull. If he tried standing again, we would at least be within bow range. My dad and I slowly made our way up to the bull, and now we were within shooting range. My dad ranged him through the grass as the bull was laying on his side with his head down. I wanted it to be over now. I asked my dad for a range and he said, “ 31, take your time.” I decided to take a few steps closer to get a more open shot. One more range, “27” said my dad. I drew back and held behind the bull’s shoulder and squeezed off the shot. My arrow hit perfect and the bull didn’t even stand up. He rolled over and kicked a few times and within a matter of seconds it was over. I could not believe what had just happened. 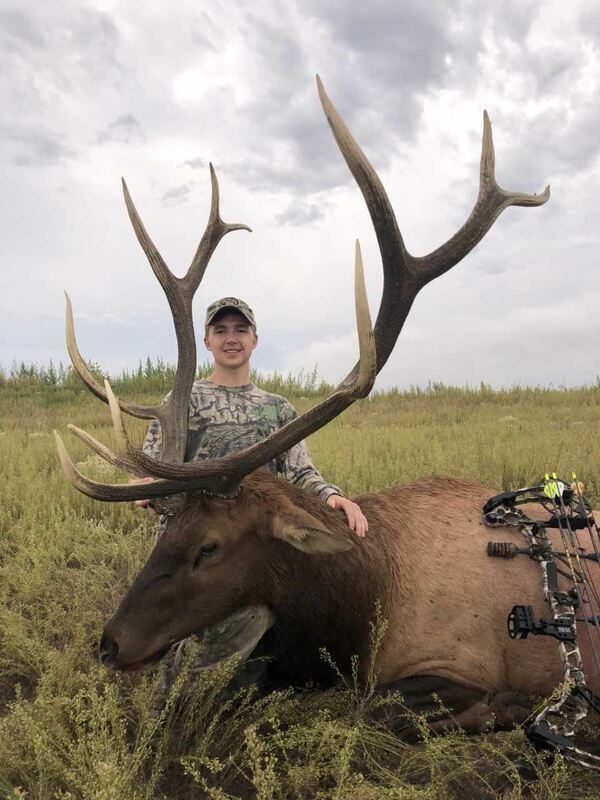 I raised my bow in the air and with tears in my eyes and a knot in my throat I hugged my dad and we began to walk towards the bull laying dead right in front of us. Neither one of us knew what to say, and we just looked at each other in complete shock. We walked up to the bull and I got down on my knees next to him. I wrapped my hands around him and lifted up his rack. I was absolutely speechless. I had just killed my first bull elk with a bow on the most unbelievable hunt that I could ever imagine. My whole life I had dreamed of killing a bull elk with a bow and now that dream had become a reality. He was now in my hands and it was all so surreal. Everything from hearing them bugle, to experiencing the highs and the lows, and getting to experience it all with my dad by my side was more than I could have ever asked for. It was absolutely perfect. A few moments later Matt called and congratulated me. He drove down to us a few minutes later as we still were trying to figure out what had just happened. There were many high fives and hugs as we stood there and admired the bull and the unbelievable hunt that had just unfolded. We took plenty of pictures and then the work began! I gutted the bull and pulled the heart from him as well as the tenderloins, which would go in the meat cooler for our enjoyment later. We spend the next hour or more trying to load the big bull in the back of the pickup. It was a tiring job, but I was so excited I didn’t care. 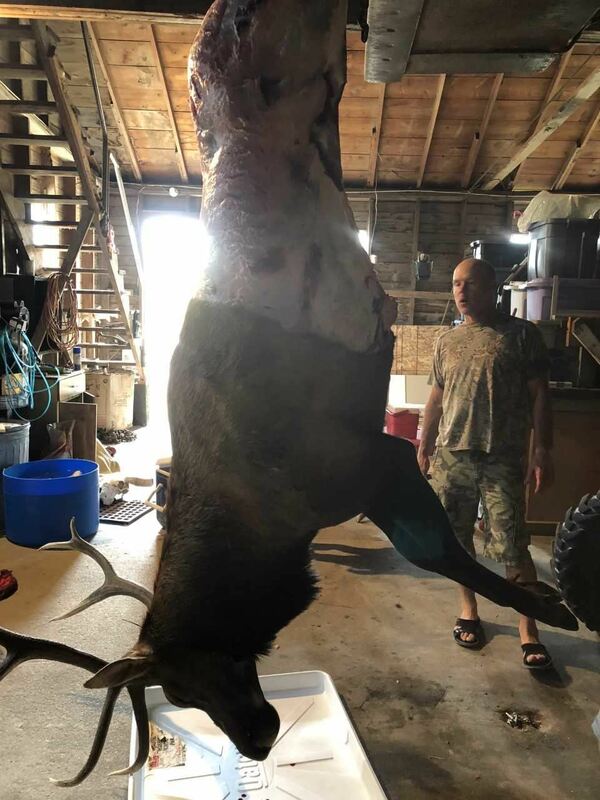 Thanks to a ratchet strap, a rope, and a few coolers, we were able to get the gutted bull into the back of the pickup and immediately get him back to the Stengel residence for butchering. We made a quick stop by the landowner’s house and needless to say, he was more than happy to see us get a bull! Again, I can’t say enough good things about the landowners that we dealt with on this hunt. 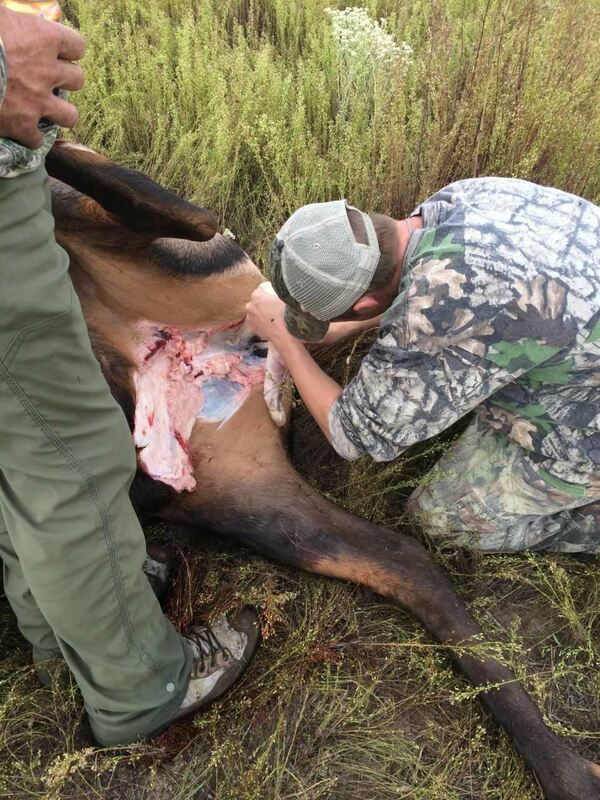 We spent that afternoon and most of the early evening butchering the big bull and getting him taken care of. By early evening we were finished and were ready to relax. 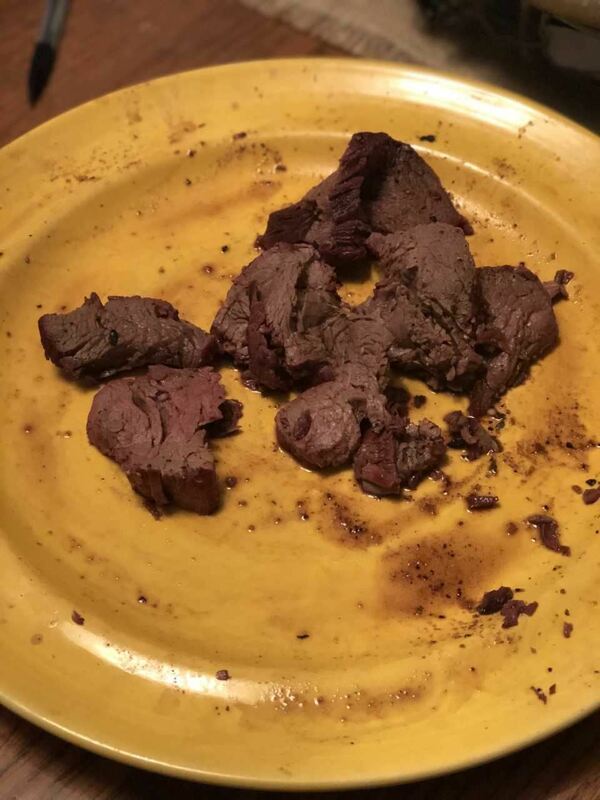 After taking care of all of the meat and talking on the phone to friends and family that heard of the successful hunt, we enjoyed fresh elk steak as we watch college football and reminisced on the hunt. It was the perfect way to end a day that I had always dreamed of. The next morning we packed up and said our goodbyes. It was an amazing weekend filled with memories that will last a lifetime. It was hard to believe that my dream had come true and it all happened on opening weekend. I could not have asked for a better way for the whole experience to unfold! As I made my way back to Kearney, I looked in the rearview mirror and had to shake my head in disbelief as I was staring at the rack of the bull. I still could not believe it and it would take some time for reality to really set in. “Not a bad investment for a $26 tag,” I said to myself. It is no doubt the best $26 I have spent in my life. As I told the stories to my friends and family, I knew that words could not do justice to what we experienced, but I knew that they understood just how much it meant to me. Getting to share some of meat with good friends and family showed them why we do it. It is some of the best meat that I have ever had and it is keeping my freezer plenty full! As I close this story, I still can’t believe that this has all happened. From drawing the tag, to experiencing elk action in its finest form, to harvesting a big bull, it was more than I could have ever dreamed. A few weeks after the elk hunt, I returned home for a Friday evening hunt after class. 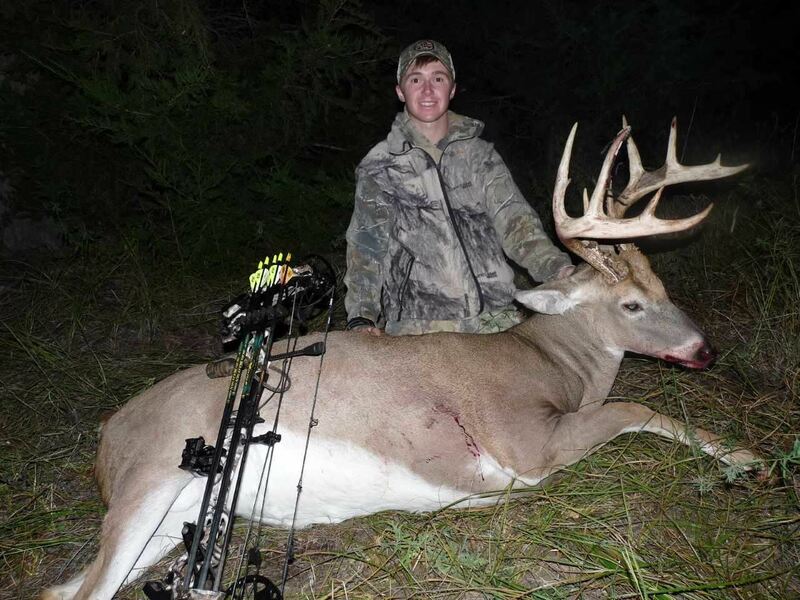 That night I arrowed one of my best whitetails to date, but that’s a story for another time!